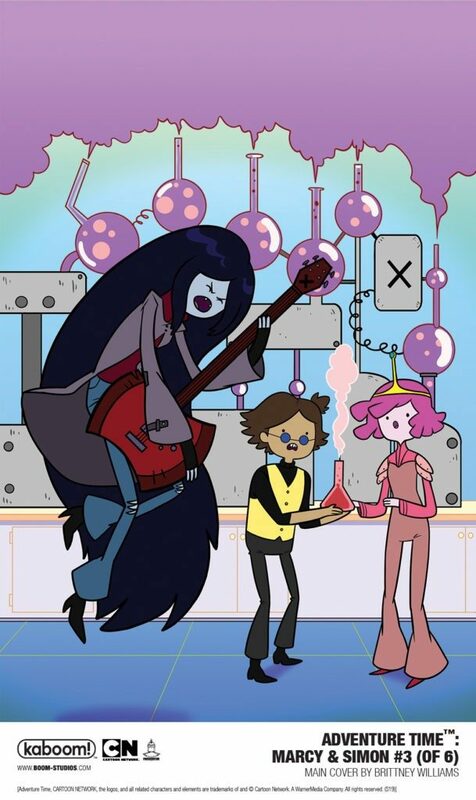 Recently, the gifted minds from KaBOOM Studios released the 3rd adventurous tale of one of new my favorite series, Adventure Time: Marcy & Simon. I have been following both the show and this spinoff continuation since they began, and over the past few years I have had the pleasure of seeing many different phases and interpretations of the groundbreaking franchise through the lens of an extraordinary cast. This team includes the returning writer Olivia Olson, the original voice of Marceline from the show, colorist Slimm Fabert, letterer Mike Fiorentino, artist SJ Miller, and cover artists Brittney Williams, Lisa DuBois, and Danielle Chuatico. With an all-star crew writing comics for one of my favorite comic book publishers, how could it get better? This time, Marceline must face her father, Hunson Abadeer, once more in the Nightosphere with Simon, Finn, Jake, and Peppermint Butler. Marcy is still on the quest to get Simon’s memory fully restored, but will the ranging feud between her and her father prevent that from happening? Will Hunson ever see the errors of his selfish ways and bring the old Simon back? Or will his attempts to be closer to Marcy mess things up even more driving them further apart? 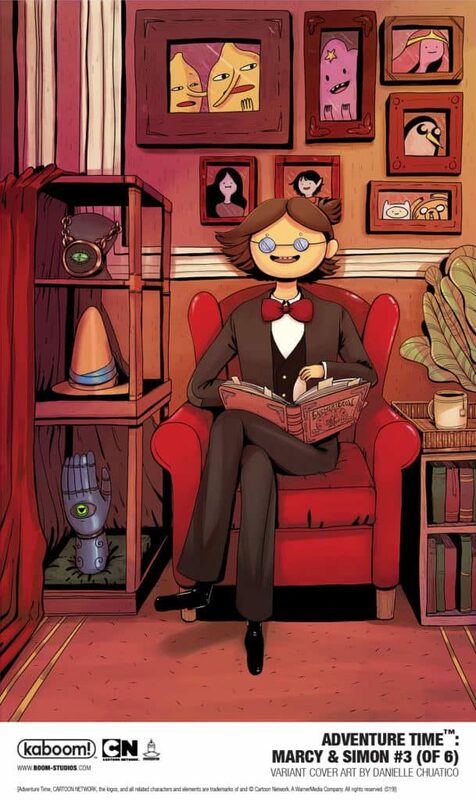 Being the mega fan that I am, I have been anxiously waiting for KaBOOM to unleash the next chapter in the heroic tales of Marcy and Simon. In the past a lot of my reviews regarding the series have talked about how it relates to the original TV show, but now that I have reached the most recent chapter of this epic collection, I what is going on with the story and have become more invested in the characters. I tend to stay away from series because I either struggle with getting invested, or I get too invested. However, this is the perfect example of something that I can relate to on both a personal level and a fandom level. I feel that Olivia Olson’s will attract new audiences to the fandom and as always gives older fans an epic story to continue carrying on the legacy that the Emmy Award nominated TV show left behind. The storyline involving characters we know and love like Hunson Abadeer and Peppermint Butler pays homage to the show’s epic conclusion that left fans outraged over the lack of their appearances. As an older fan of Pendleton Ward’s creations, I know what to expect out of a classic Adventure Time tale, and this comic did not disappoint! The artwork is simple and stylistic, while still holding onto the authentic original feel that fans have grown to expect out of these comics. The characters, setting, and the overarching themes/morals do not disappoint even the most nitpicky of fans. Knowing the original tales of Simon, Ice King, Marcy, and Hunson, Marcy & Simon #3 took me on an emotional roller coaster. Fans know who Simon used to be, but fans will never expect what lies ahead for Simon on his next journey, leaving them on the edge of their seats wanting more. Will Simon be able to escape his next mess? Or will he forever be lost to the fate of Hunson Abadeer? A lot of times the story in a miniseries gets lost and/or overtaken by a jumble of random ideas that skew away from the original story. I always enjoy seeing older characters be brought back in new forms because it gives older fans something to look forward to when reading. I will say that even though I love other franchises involving adventure, I would become more invested in newer series if it were as well thought out and planned as this one. If all comics were as great as this one, then I would never stop reading. As always, the art from SJ Miller is outstanding, and the character development, overarching themes, and clever anecdotes from the team are creative and original. With all this combined, comics like these have a bright future of growing stronger. 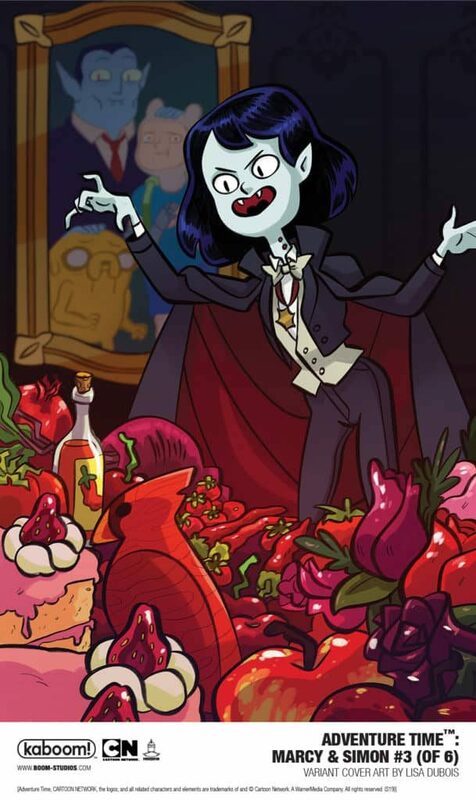 I cannot wait for the next installment of Marcy & Simon to see what happens in their next epic adventure!